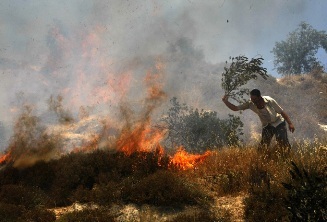 A group of fundamentalist Israeli settlers torched, Wednesday night, an 11-Dunam olive orchard in al-Rababa valley, in Silwan, south of the Old City of Jerusalem.The Maan news Agency reported that three olive trees, over 300 years old, were burnt down while dozens of trees were partially burnt. The attack took place while thousands of Jewish settlers held a provocative procession in Silwan under extensive Israeli police presence. Yet, the police did not prevent the settlers from torching the orchard. On Tuesday at dawn, May 4, a group of fundamentalist settlers torched the main mosque of the al-Lubban al-Sharqiyya village, south of the northern West Bank city of Nablus. The settlers attacked the mosque approximately at 3 a.m., rounded up several copies of the Holy Koran in one place and set them ablaze. The fire caused excessive damage to the property of the mosque, including its ceiling, its ceiling fans and walls. Its 450 square meters of carpet and eight air conditioners were burnt also. This is the third mosque to be torched by the settlers this year as the settlers torched a mosque in Yasuf village near Salfit, and another mosque in Huwwara town, near Nablus. In April, settlers torched three Palestinian vehicles in Huwwara town, near the northern West Bank city of Nablus and sprayed “price tag” graffiti on a local mosque. Two days after the attack in Huwwara, the settlers torched two Palestinian cars in Jinsafut village, near the northern West Bank city of Qalqilia. The settlers also sprayed the star of David on a building in the same village. In December of last year, a group of settlers torched a mosque in Yasuf village, near the central West Bank city of Salfit, and also sprayed “price tag” on its walls.